As a dietary supplement, take 1 scoop with 8 oz (236 mL) of cold water 15-30 minutes before training. To avoid sleeplessness, do not take within 4 hours of sleep. Not for use by those with pre-existing medical conditions; those taking any medications; those under the age of 18; those who are caffeine, niacin or Beta-Alanine sensitive or women who are contemplating pregnancy, pregnant or nursing. Consult your physician prior to using this product if you are taking any prescription or over-the-counter medications or supplements. Do not use this product if you are at risk or are being treated for any medical condition including, but not limited to: high or low blood pressure; cardiac arrhythmia; stroke; heart, liver, kidney or thyroid diseases; seizure disorder; psychiatric disease; diabetes; difficulty urinating due to prostate enlargement or if you are taking a MAO inhibitor. Discontinue use and consult your healthcare professional if you experience any adverse reaction to this product. Keep out of reach of children. Do not exceed recommended serving size or suggested use for any reason. Discontinue use 2 weeks prior to surgery. Citric Acid, Natural And Artificial Flavor, Silica, Malic Acid, Sucralose, Acesulfame Potassium, FD&C Yellow 5, FD&C Blue 1. Citric Acid, Natural And Artificial Flavor, Silica, Malic Acid, Sucralose, Acesulfame Potassium, FD&C Red 40. EVL Sports PumpMode Capsules bring a unique innovation to the game - a cap-in-a-cap system that delivers PURE 100% glycerol with nitrates for pumps! 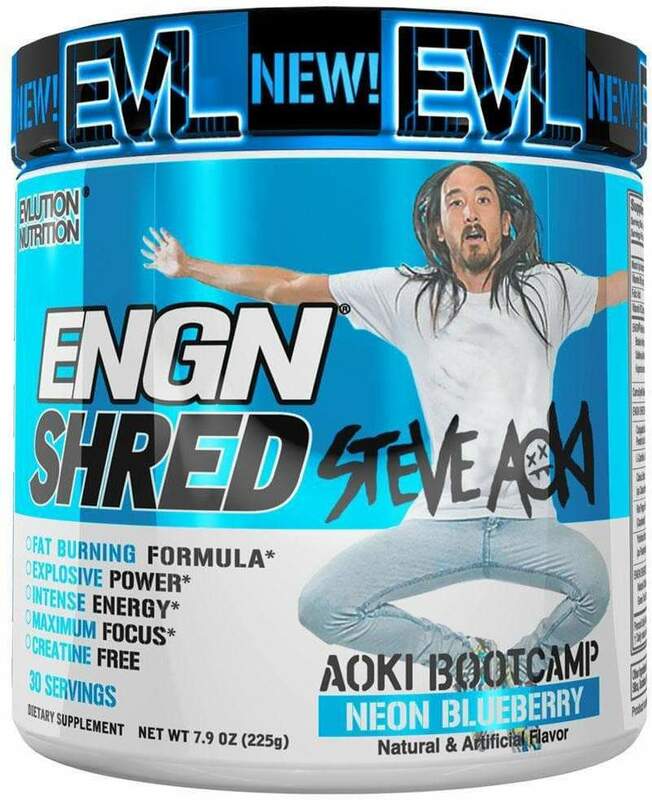 WHY IS ENGN SHRED MORE ADVANCED THAN ANY OTHER PRE-WORKOUT? ALL ATHLETES! 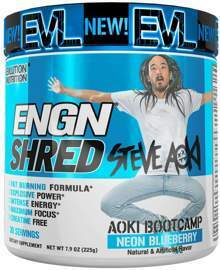 ENGN SHRED has been designed to fuel all athletes whether you are a track star, bodybuilder or action sports athlete ENGN SHRED will fuel you. Take 1 scoop 15-30 minutes prior to training with 8 ounces of cold water.